Should investors book with airline industry standby Delta Air Lines (DAL) or the discounters assailing the industry's old guard? Delta stock battled back on Tuesday to a mild gain at market close, suggesting that the market may be pricing in the impacts that should have been arguably already priced in with the company's pre-forecast to kick off the year. The company's market share remains among the tops in America and could serve to bolster the bottom in the stock as well. 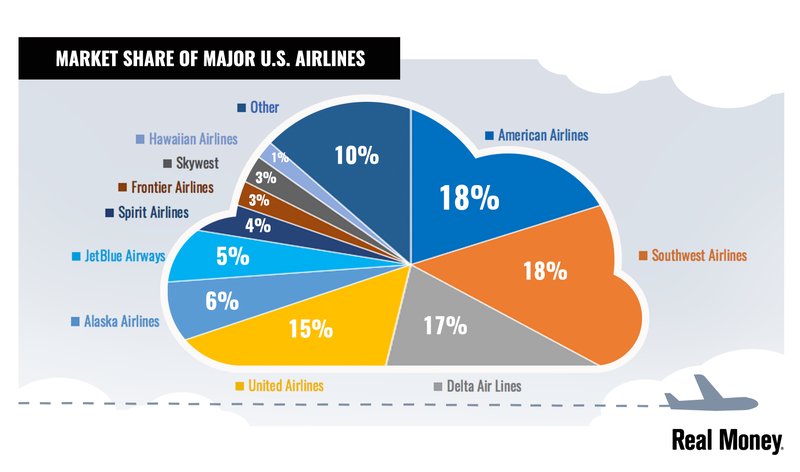 Globally the airline is second only to American Airlines (AAL) in terms of total passengers. Further, the company's financial profile and executive stewardship is among the tops in the industry and has received analyst adulation on that front. Shares of Delta are popping even further after hours on the market shifting more positively on the stock amid calming analyst comments such as Baker's. Perhaps even more appetizing for investors looking for the airline standbys is United Continental Holdings (UAL) , which cruised past Delta with a better than expected earnings result on Tuesday evening. In contrast to Delta, the company posted a 5% gain in unit revenue compared to the fourth quarter of 2017. "United's financial performance is a testament to the successful implementation of the first year of our strategic plan and to the record-setting operational performance powered by the more than 90,000 airline professionals who work at United," Oscar Munoz, chief executive officer of United Airlines, said. "United delivered proof, not just promises in 2018 - even in the face of significant headwinds from higher than expected fuel costs. It's why I couldn't be more proud of our winning culture and customer-focused team and continue to be enthusiastic about United's bright future." While the company does not deliver the dividend protection found in Delta, the bullish results and forecast even amid a more chellenging environment suggests it is ascendant among airlines. Shares of United are rocketing nearly 6% after hours on the print and press comments from executives. Interestingly, as one scans the list of market leaders in terms of total passengers, famously discounted tickets at the Dublin-based Ryanair (RYAAY) come in at number five. The low-cost leader is at the forefront of the price focused shift in airline pricing that necessitated even Delta's shift towards economical seat allowances. The shift has allowed companies like the Iceland Air-owned WOW Air, Norwegian Air Shuttle (NWARF) , and EasyJet Plc (ESYJY) to become major players globally. Stateside, Frontier Airlines and Spirit Airlines (SAVE) have become the stalwart for savings-minded travelers. 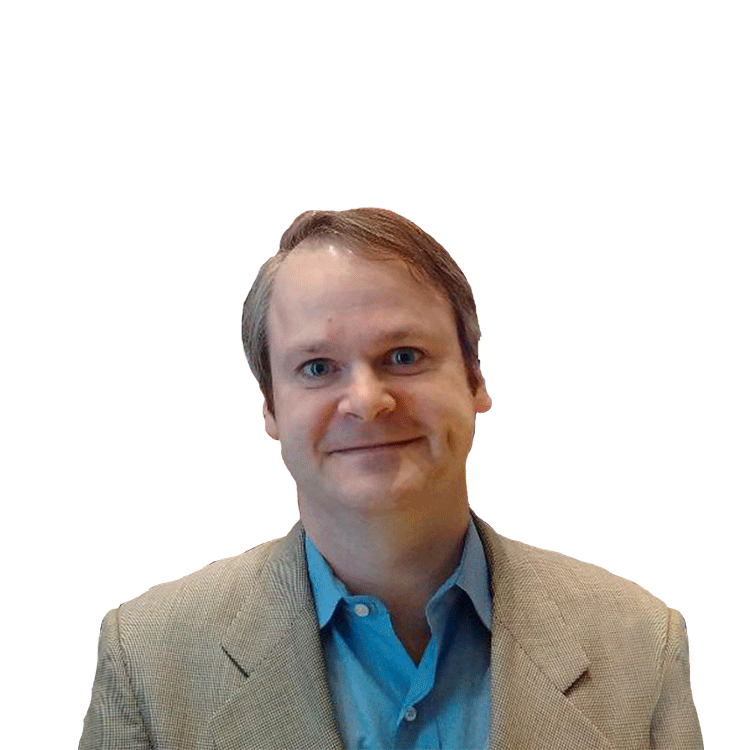 Each has managed to carve out their own comfortable segments of the U.S. market. That might only serve to stay the case as millennials focus more on the cost of travel to a destination rather than the comfort of the travel itself. As the generation should shortly overtake baby boomers in size, the longer term thesis for focusing on the younger generation is a salient one. "You've got value-led airlines such as Jet Blue (JBLU) and budget airlines such as Frontier, which are able to appeal to millennial travelers because they do all the really good pricing," travel industry analyst Harteveldt told Vox earlier this month. He argued that the focus on cost is key for airlines aiming at the growing segment of the airline market. The thesis continues to snowball as research shows that the focus of many companies on business travel is misplaced, considering the long-held profit driver makes up a significantly smaller segment of the air travel industry than it once did. According to Ipsos Group SA, a global market research firm, the percentage of business purpose flights has waned from 47% of all trips in 1997 to just 31% in 2015. 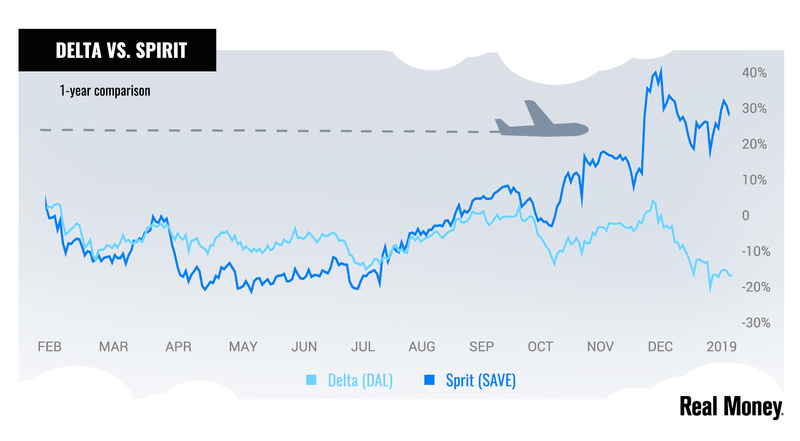 Additionally, cost-saving airlines appear to be more resilient to turbulence than traditional carriers, as exemplified by the stock trend divergence between Delta and its major low-cost competitor in the U.S., Spirit Airlines. The problem with discount airlines, that has impacted efforts like Air France's (AFLYY) failed millennial-minded JOON venture and diminished WOW Air's route reach is the margin pressure these airlines encounter. To compensate for the loss in business travel, the carriers count on passenger volume and fees attached to baggage and extra perks like leg room. So, while the trajectory of the price-trimming model does look attractive, the beta attached to these stocks will certainly be higher than that of Delta. The question will ultimately come down to whether or not one is looking to play a longer-term secular trend that looks resilient to market turmoil, but carries the risk of a tightly squeezed seat, or a business class seat with a dividend refreshment mid-flight, but a potentially lower cruising altitude and an older clientele.